Acai berry is the fruit of a type of palm whose scientific name is “Euterpe Oleracea” and is a commonly eaten food in the Amazon. The acai has a very pleasant taste being a mixture of chocolate with a hint of cherries and now it is widely used in a variety of applications. 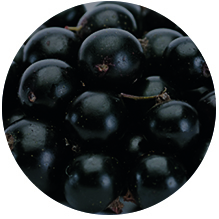 High oxidant power due to high concentration of polyphenols, which have an important role in fighting oxidative stress caused by the action of free radicals. Rich in Omega 6 and Omega 9. Contains high amounts of vitamins and minerals and helps the digestive system to work properly. 2 tablespoons per day is the suggested use. Beverages (juice blends, smoothies, energy drinks). Nutritional supplements (capsules, tablets, whole food powder). It can also be made into a nutritious and flavorful juice by using 2-3 tablespoons per 0,25L of water.